A 75-year-old man is brought in to your office by his wife. She complains that he is not the same over the last 6 months. His memory is failing him, he has difficulty walking (especially when he initiates walking), and he is incontinent of urine. Which of the following is the most likely diagnosis based on his history? 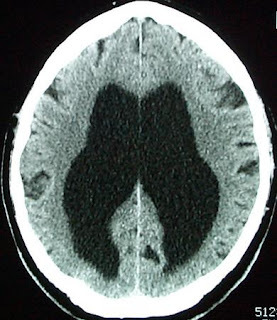 Normal-pressure hydrocephalus (NPH) is a cause of dementia in the elderly. It may be caused by previous insult to the brain, usually as a result of a subarachnoid hemorrhage or diffuse meningitis that presumably results in scarring of the arachnoid villi over the brain convexities where cerebrospinal fluid (CSF) absorption usually occurs. However, elderly NPH patients seldom have a history of predisposing disease. NPH classically consists of dementia, apraxia of gait, and incontinence, but many patients with these symptoms do not have NPH. Typically, motor weakness and staggering are absent, but initiation of gait is hesitant—described as a “slipping clutch” or “feet stuck to the floor” gait—and walking eventually occurs. NPH has also been associated with various psychiatric manifestations that are not categorical. NPH should be considered in the differential diagnosis of any new mental status changes in the elderly. CT or MRI and a lumbar puncture are necessary for diagnosis. On CT or MRI, the ventricles are dilated. CSF pressure measured by a lumbar puncture is normal. A limited improvement after removing about 50 mL of CSF indicates a better prognosis with shunting. Radiographic or pressure measurements alone do not seem to predict response to shunting. Shunting CSF from the dilated ventricles sometimes results in clinical improvement, but the longer the disease has been present, the less likely shunting will be curative.